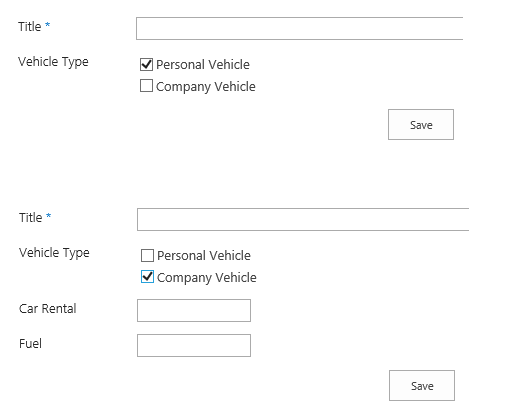 I am working with SharePoint online and in one of the lists, I am using a choice check box column called 'Vehicle Type' with following choices: Personal Vehicle, Company Vehicle. I am looking to do a simple thing, when Personal vehicle is checked, then I would like to hide two currency columns: Car Rental, Fuel and if Company Vehicle is checked I want to show the above two columns. Can someone help me with the JS solution. Thanks in advance. P.S: it should account for the change event. I create a test custom list and add new column 'Vehicle Type'(choice Checkbox field type) with following choices: Personal Vehicle, Company Vehicle. And two currency columns: Car Rental, Fuel. Then add the following code into script editor web part in newform.aspx page.